Here is the most beautiful song Jalte Diye from the movie Prem Ratan Dhan Payo. 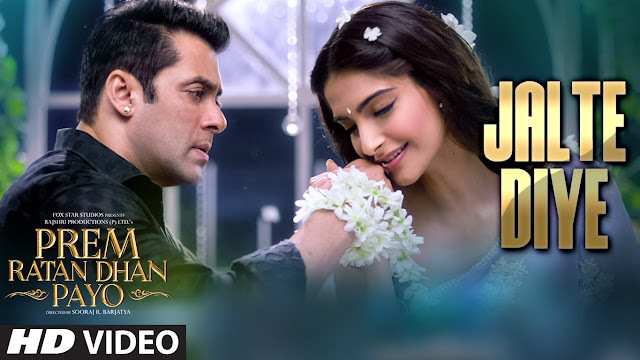 Salman Khan and Sonam Kapoor are looking fabulous in the song. The music is composed by Himesh Reshmmiya and Anwesshaa, Vineet Singh, Harshdeep Kaur, Shabab Sabri gave their magical voice for it, lyrics are from Irshad Kamil. Prem Ratan Dhan Payo is an upcoming Indian family drama film, written and directed by Sooraj Barjatya, produced by Rajshri Productions and distributed by Fox Star Studios. It sars Salman Khan and Sonam Kapoor in lead roles. This will be the fourth collaboration between Sooraj R. Barjatya and Salman Khan after their previous blockbusters Maine Pyar Kiya, HAHK and Hum Saath Saath Hain.